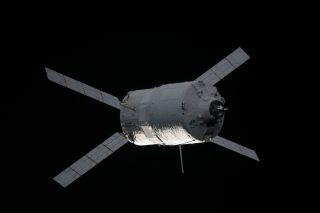 European Space Agency's "Edoardo Amaldi" Automated Transfer Vehicle-3 (ATV-3) nears the International Space Station, on March 28, 2012. An unmanned European cargo ship as large as a double-decker bus inside will have to wait a bit longer before leaving the International Space Station due to computer problems, NASA officials say. The robotic Automated Transfer Vehicle 3 (ATV-3) spacecraft was slated to undock from the space station Tuesday evening (Sept. 25), but a technical glitch with a laptop computer inside the station prevented to orbital departure. The two spacecraft were scheduled to part ways at 6:35 p.m. EDT (2235 GMT). "We're not undocking today, that's been canceled," a flight controller in Mission Control told the station's three-person crew. Station commander Sunita Williams of NASA told Mission Control that commands sent from the laptop apparently were not reaching the ATV spacecraft. Engineers are expected to meet early Wednesday to discuss the malfunction and determine when the next undocking attempt can be made, NASA officials said. The space station's current Expedition 34 crew includes Williams, Japanese astronaut Akihiko Hoshide and Russian cosmonaut Yuri Malenchenko. The ATV-3 spacecraft, which is also known as Edoardo Almadi in honor of the late Italian physicist of the same name, is the third unmanned cargo ship built by the European Space Agency to send food, water, science gear and other supplies to the International Space Station. The spacecraft launched to the station in late March and delivered 7.2 tons of food to the orbiting lab. The cylindrical ATV spacecraft are 32 feet long (10 meters) and nearly 15 feet wide (4.5 m). They are disposable spacecraft designed to fly themselves to the space station, and then be jettisoned at mission's end to burn up in Earth's atmosphere somewhere over the Pacific Ocean. The European Space Agency commands the spacecraft from a mission control center in Toulouse, France. The fourth ATV mission will launch the ATV-4 Albert Einstein to the station in April 2013. Europe's ATV vehicles are part of a robotic spaceship fleet that regularly haul supplies to the space station. Russia's unmanned Progress vehicles and Japan's H-2 Transfer Vehicles have also made delivery flights to the station. NASA has contracted the private spaceflight companies SpaceX, of Hawthorne, Calif., and Orbital Sciences Corp., of Dulles, Va., to build unmanned cargo ships for station deliveries. SpaceX performed the first test flight to the station using its Dragon cargo ship in May and is expected to launch the first official delivery flight to the orbiting lab on Oct. 7. SpaceX has a $1.6 billion contract with NASA to provide 12 Dragon delivery flights. Orbital Sciences has a $1.9 billion contract with NASA for eight delivery missions using its Cygnus spacecraft.